v4vita and its people are clearly affected by the history, values and rich tradition of Crete. That could not but be reflected in the company logo, an element that highlights and promotes its importance. It is a 3,800 year-old inscription (1800 BC) unearthed in the palace of Knossos, with signs that are believed to represent syllabic, and ideographic values of Linear A. Along with Cretan hieroglyphic, Linear A is one of two undeciphered primary scripts of the European civilization and one of the most ancient writing systems of the world. It was used solely by the peoples of Crete and the nearby islands. It is related to the Linear B script, which succeeded the Linear A and was used by the Mycenaean and Minoan civilizations. 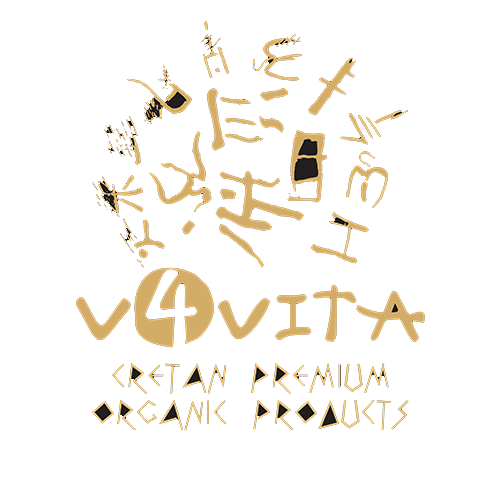 The logo and some of the v4vita products depict ideograms and syllabi of Linear A. The vision of the company is to help contemporary man maintain their contact with the history, culture and values that Crete has always advocated.